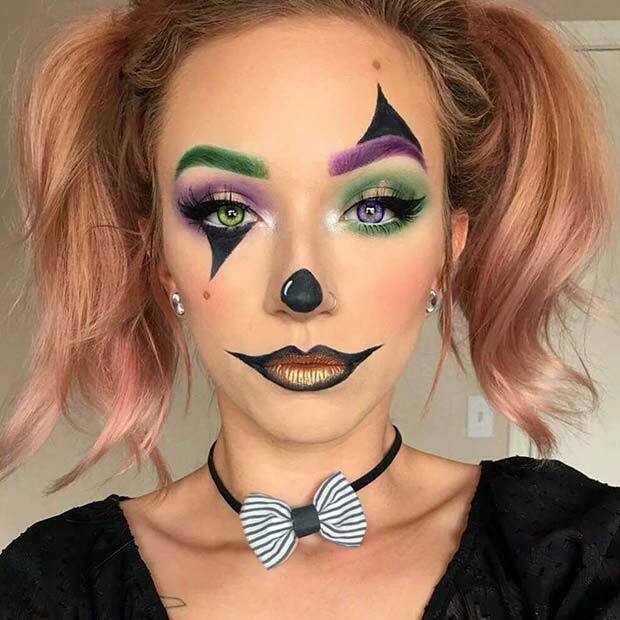 Halloween makeup ideas are a lot of fun, but doing your own makeup might seem like an intimidating task, but it’s the perfect opportunity to show off your artistic and creative skills! It’s also a great excuse to use a dark, edgy eyeshadow or lipstick you would otherwise never dare use. But let’s face it, choosing from all the available Halloween makeup ideas isn’t that simple. You might also get discouraged or stay away from it entirely, but with decent how-tos, it becomes a lot of fun and a nice thing to look forward to. What’s more, getting a nice makeup will get you more compliments than getting a generic costume that everyone’s seen or is the hot stuff of the year. Let’s get started, shall we? To start things off easy, here’s a spooky and beginner-friendly Skeleton Makeup tutorial. Just start it like you do any makeup, cleanse your face and apply a toner or moisturizer. Next, use white face paint for the base, then draw the bags under your eyes. Finish by contouring your nose and drawing the mouth. Pair it with a black and white t-shirt and a pair of color contact lenses. You don’t need a white base to make this cracking image on your face. Just make it seem like your veins are drying out, and it will give the desired spooky effect. Grab a pair of dark color contacts, a white or dark dress and you’ll become the scariest Haunted Soul! Do you remember Corpse Bride? We certainly do! Just apply a blue face paint, leaving out your eyes and wait until it dries. Then contour your eyes with white and blue paint. Next, draw the eyes and the hole on your face. Use a blue, long wig and hair accessories. Wear it with a wedding dress and get ready to mesmerize everyone! But if someone wants to take your picture, make sure to close your eyes this time. IT was a massive hit last year, and both costumes and makeup have been inspired by it. The Half Clown was inspired by the movie, but you can use any clown as inspiration. The trick is to make one side of your face white-red while keeping the other side normal. Add creases to make the transition between a clown and a human more realistic. Pair it with plain shirts or a half design that matches your face. With cartoons like Rick and Morty hitting the mainstream, it might be a good idea to dress up as a character. Although Supernova isn’t a main character, she definitely makes for a nice looking and interesting one. 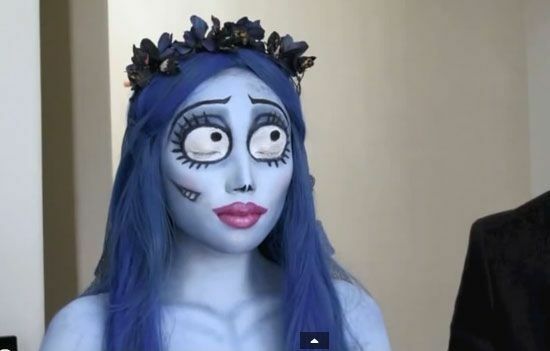 All you need is a blue wig, contoured eyes and face paint. You can also make it more authentic by making a handcrafted headpiece (or draw the lines) and color lenses. Next, here’s a creepy Sparkle Clown. The eyes and mouth have a nice tone and shape to them, and they look fresh and glam by adding black glitter. You can recreate this easily or choose a different color of your choosing. You don’t always have to choose from the scary Halloween makeup ideas to make a memorable design. Similar to what we had previously, the IT clown is still a well-known design. Now scarier and focusing on It’s sharp teeth. You can replicate the teeth illusion by drawing them, or buy teeth that resemble it. No matter which you choose, you will terrify anyone that looks at you. 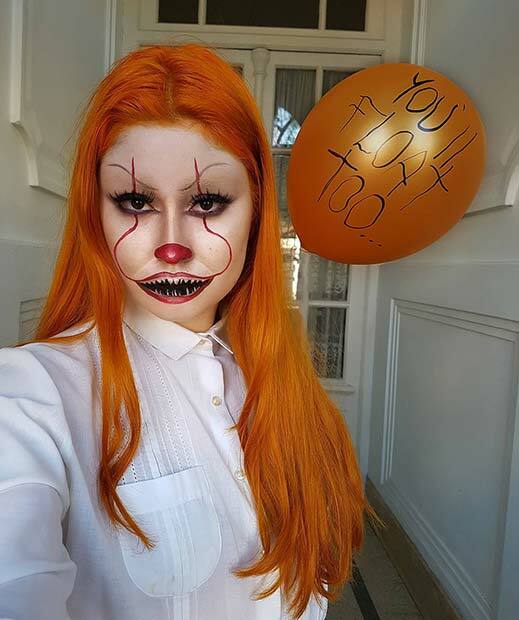 Pair it with a white dress, a red balloon, and the Scary IT Clown Halloween makeup is done! Harley Quinn… Fancy trying to rock this bipolar, psycho look? Start by applying a white base with a brush, then blend it with a beauty sponge. Then fill your brows with an eyeshadow and a bright red color around your right eye, and with a brush, make it look like it’s leaking. Don’t aim for perfect, the messier it gets the better. Do the same for your left eye with a blue shade. You can also use false lashes. Now, just draw the heart symbol on your cheek with black eye pencil and contour your eyes. Finish the job with red lipstick – the brighter the better! If you can’t buy the iconic shirt – that’s all right. Wear a white shirt with text on it and pair with a red or blue jacket. For your hair, wear pigtails. 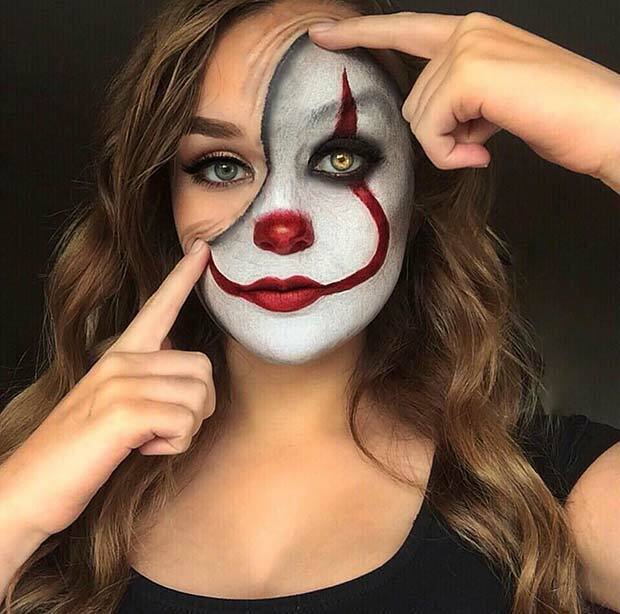 Here’s my favorite of all the Halloween makeup ideas! The Flashy Clown! This cute and colorful clown has got to be my favorite on this list! The design features purple and green colors in perfect harmony. You don’t need a white base (although I do suggest using a base!) so it isn’t that hard to make! Use purple eyeshadow on one brow, and green on the other. Use the same alternating color scheme, even with color lenses, and you’ll have the most memorable makeup this Halloween! Rock it with a choker or any accessory, a lipstick that will enhance your eyes and face. If you aim for evil over scary, try recreating the Wicked Witch! 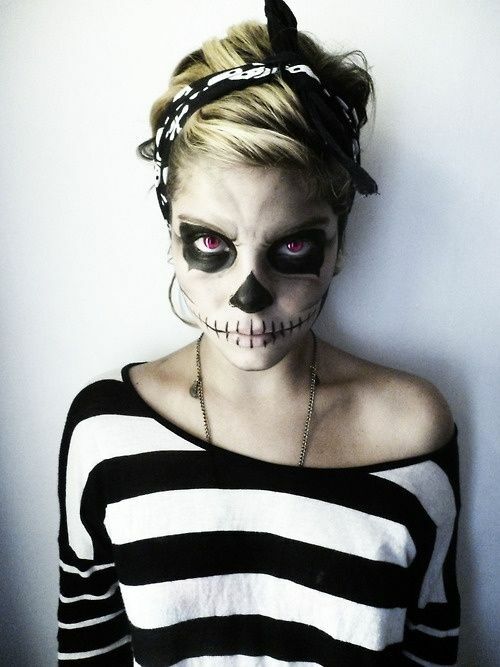 Witch costumes are popular every year, so why not mix things up with a creative Halloween makeup? Toss away the green aesthetics and long nose, use dark shades and lines. Apply a pale base, blend it out, then fill your brows with a dark color. Then just follow the video tutorial which perfectly gives you a step-by-step guide. I hope you’ve been inspired by our Top 10 Creative and Horrifying Halloween Makeup Ideas! If you liked our article, make sure to pin it on Pinterest! It would mean the world to us! Here you can find more spooky tutorials, food ideas, crafts, and nail ideas!